International Journal of Research in Health Sciences,2014,2,1,140-145. 1,4Assistant Professor, 3Associate professor, 2,5Postgraduate, Upgraded Department of Pathology, Osmania General Hospital, Hyderabad, A.P, INDIA. Spinal cord tumors are rare among the tumors of central nervous system (CNS). They constitute 4 - 16 % of all the CNS tumors and of these spinal nerve sheath tumors constitute significant group, situated mostly in the intradural location. The study was undertaken to report the spinal nerve sheath tumors received at the tertiary care centre over a period of 3 years with review of literature. 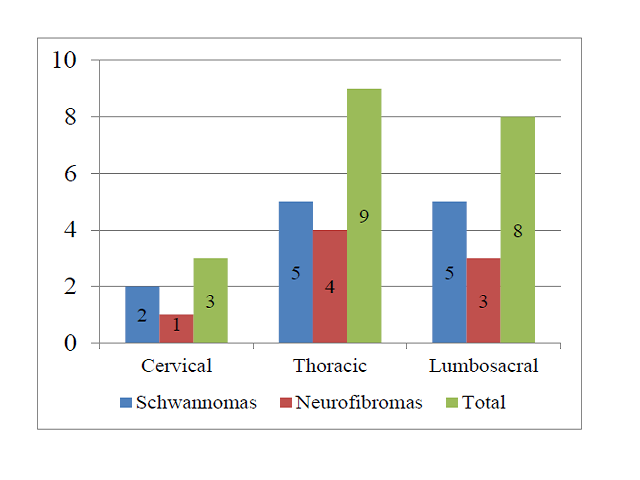 Schwannomas were common nerve sheath tumors with 60% cases followed by Neurofibromas with 40% cases, mostly located intradurally. Both the lesions showed male predominance. These tumors have to be distinguished from one another as the treatment and prognosis varies.